1. I believe that Jesus Christ is God’s self-giving Word. 2. I believe that this Word is a wholly good Word for all people. 3. I believe that this good Word is the meaning of life. that Bultmann was a pious churchgoer? that he wrote an early book on patristic exegesis? that he wrote fables (myths!) for his wife during their courtship? “If what we do now makes no difference in the end, then all the seriousness of life is done away with”—a remark which Ludwig Wittgenstein made to his friend Drury, skewering the universalist heresy. Wittgenstein was a deeply serious man, and I believe he developed insights which all theologians need to absorb. 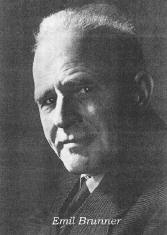 While it is debatable whether he was in fact a Christian, he certainly believed in God, and he infamously saw things “from a religious point of view.” While at service on the Eastern Front in World War I, he was known as “the man with the gospels,” as he never went anywhere without taking Tolstoy’s summary with him. He was a rather tortured soul in terms of his sexuality; he revered Augustine (the greatest influence on his own thought—he felt the Confessions to be “the most serious book ever written”); he hated virtually all modern music (you could “hear the machinery in Mahler”); and he gave up all his wealth to his sisters, since he felt that they were the only people unlikely to be spoiled by it. Clearly, in a different era, he would have been a monk, possibly a hermit. I find him a compelling human being: complex, flawed, yet gripped by the claim of the divine upon his life. 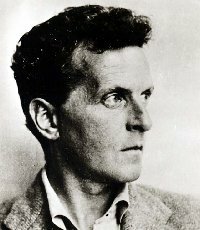 What is most important about Wittgenstein is his method of philosophy, which prevents a fruitless pursuit of metaphysical “solutions”; more precisely, it teaches us what metaphysics actually is. Thus Wittgenstein’s method is a necessary discipline for theologians, as it prevents us from mis-characterising the nature of Christian doctrine. As he put it himself: “Christianity is not a doctrine, not, I mean, a theory about what has happened and will happen to the human soul, but a description of something that actually takes place in human life. For ‘consciousness of sin’ is a real event and so are despair and salvation through faith. Those who speak of such things (Bunyan for instance) are simply describing what has happened to them, whatever gloss anyone may want to put on it.” Wittgenstein has had a great influence on contemporary theology, from Stanley Hauerwas to Herbert McCabe—and it seems to me to be a wholly beneficial influence. While most understandings of Wittgenstein emphasise the “Sturm und Drang” of his life, I think there is also an under-appreciated current of joy. He used to relax by going to the cinema, especially enjoying Westerns—and he found this to be of value. He wrote early in 1947, “I have often learnt a lesson from a silly American film”—and I believe that he watched something that year which gave him some inner peace, that allowed him to believe that his life was worth something after all. After all, his last words were: “tell them I’ve had a wonderful life.” I like to think it was what he had in mind. Many thanks to Baker Academic for sending me a review copy of Kurt Anders Richardson’s recent book, Reading Karl Barth: New Directions for North American Theology. In this book, Richardson brings Barth’s theology into dialogue with various aspects of contemporary theology, and he seeks to take up Barth’s thought as an instrument of theological and ecclesial reform. 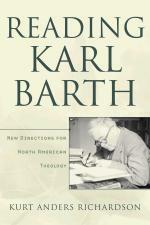 Although it is an uneven book, and although it is not structured as clearly as it might have been, Richardson has a fine instinct for interpreting Barth, and he understands clearly what is involved in reading the Church Dogmatics: “To read the CD is more than a literary act or even a philosophical one; it is a religious act because Barth’s work is so fundamentally shaped by his testimony to the Word of God” (p. 12). To read Barth correctly, then, we must read him as a “witness”—and this will always mean to read him in relation to our own theological questions, “to read him and then to move on” (p. 23). At the heart of Richardson’s own reading of Barth is the conviction that we should begin at the end of the CD, reading the whole work “back to front.” The little fragment on baptism (CD IV/4) thus becomes a “lens” for interpreting Barth’s theology. Although this exciting approach is announced at the beginning of the book, Richardson only develops such a reading in detail in Chapter 6. This is by far the best and richest part of the book—and it’s worth the admission fee for this chapter alone (pp. 161-208). Here, following Eberhard Jüngel, Richardson explores the (anti-) sacramental theology of CD IV/4 as the hermeneutical key to the whole of Barth’s dogmatics. The triadic structure which Barth develops in IV/4—Deus extra nos, Deus pro nobis, Deus in nobis: “God outside us, God for us, God in us”—is taken up as the underlying logic of the entire CD, and as the most refined expression of Barth’s doctrine of election. No one has written more acutely and extensively on Barth’s doctrine of baptism than Eberhard Jüngel. And in a lengthy engagement with Jüngel (pp. 176-208), Richardson defends Jüngel’s interpretation of Barth and sharply critiques George Hunsinger and John Webster for muting or dismissing this radical, reforming doctrine of baptism. Just as Jüngel makes IV/4 the true test of Barth-reception—“whoever wishes to baptise infants should not proclaim his closeness to Barth’s doctrine of predestination!”—so too Richardson critiques all readings of the CD that privilege the sacramental language which Barth was still using in I/1. Only with the development of his doctrine of election (II/2) did Barth wholly overcome the notion that human action can in any way be “analogous to divine action” (p. 193). Here, Barth’s “analogy of faith” (analogia fidei) achieves its full depth and systematic expression. And it is finally in the doctrine of baptism (IV/4) that “the trajectory of the entire CD achieves a striking degree of clarity” through its expression of the central themes of “correspondence, election, and the distinction between divine and human action” (p. 206). I posted on this topic a while back, and you can now vote on it in Jim West’s poll. Karl Barth once remarked that it is impossible to “believe in” the devil, since the devil deserves only an attitude of utter disbelief—we do not believe in him, but against him. Barth was right: if you want to “believe in” something, it’s much better to believe in God! And belief in God is itself also a denial and rejection of the powers of nothingness and of all the dark glory of their parasitic pseudo-existence. Being an undergraduate in St Mary’s College at St Andrews University, there is little chance you will survive without some knowledge of the giant of twentieth-century theology, Karl Barth. The place is steeped in his legacy, and his name is bandied about throughout the disciplines—in theology, church history, ethics, and even biblical studies. However, being a naturally rebellious type, I quickly tired of the irrational love of Barth among my fellow students (many of whom had only flicked through Dogmatics in Outline), and I sought out ways to shatter their naïve dreams of theological completeness. And there he appeared in the shadows: a man who was facing the same Sisyphean task as myself; a man who stood up to Karl Barth; a man who provoked Barth to cry “Nein!”; a man who travelled against the grain. These were the circumstances of my introduction to Emil Brunner, peripheral as they were, yet leading to a fully-fledged appreciation of this Swiss theologian. 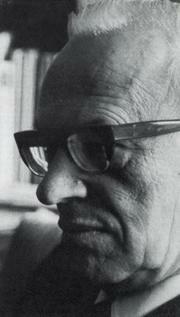 There are many other reasons why I love Brunner—his books are cheap because they are shadowed by Barth; unusually for a German-speaking theologian, his work is concise; his name has a wonderfully mystic ring; and he had a missionary heart, and served in such places as Japan, Korea, India and Pakistan. But time has gone, and my words have been few and clumsy. If you ever see that Brunner volume lying forlorn on the dusty shelf of the library or the second-hand bookstore, pick it up. Lose yourself in the pages of a man whose main aim was to meet with the God who communicates himself, and to tell the world of this God who relates. I’ve just added a new poll, which asks you to vote for the worst liturgical invention in recent history. This will be a tough competition—and there are so many other worthy candidates that could have been included. Each church tradition has its own array of bad or silly or questionable liturgical inventions. But for this poll I simply included some of my own favourite candidates, ranging from the embarrassing (e.g. tacky banners which guard against the possibility of deep feeling) to the bizarre (e.g. liturgical dance, especially when performed by people who cannot dance) to the downright pernicious (e.g. the altar call as the third Protestant sacrament). If I could have chosen just one more for the poll, I might have mentioned the custom of baptising with as little water as possible (just a tiny damp smear on the forehead), or perhaps the use of ludicrous clip-art in church bulletins, or the serving of undrinkable coffee after worship, or those harsh wooden pews that can turn even a sermon about heaven into a foretaste of hell. —Eberhard Jüngel, Paulus und Jesus (Tübingen: Mohr Siebeck, 1962), p. 163. 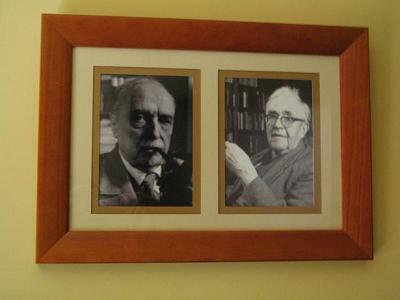 Thanks for the various posts about my fictional piece on Barth and Bultmann. Over at Jared Coleman’s blog I’ve also posted some comments about Barth’s relationship to his beloved assistant, Charlotte von Kirschbaum. Inspired by the superb Biblioblogs site, our friend Patrik has set up a new site for Theology Blogs. If you have a theological blog, you can submit it so that it is included on the list. John S. Kloppenborg, The Tenants in the Vineyard: Ideology, Economics, and Agrarian Conflict in Jewish Palestine (Tübingen: Mohr Siebeck, 2006). Bultmann furrowed his brow and breathed a long stream of smoke. “Ah, yes, you are happy simply to speak! And so you think you can merely adopt the language and concepts of the New Testament, as though nothing could be plainer. But you forget all about the gulf that separates our world today from the world of the New Testament. The people who read your Dogmatics are no longer living in the first century, Karl. So how are they to understand you when you use concepts that no longer have any clear meaning? How are they to understand you unless you first interpret these concepts? To be more precise, how can the message of the New Testament be communicated without first being translated?” He tapped his pipe sharply against the ashtray to underline each syllable of the final word. But Barth waved his pipe excitedly and continued. “You think there’s a gulf between modern people and the message of the Bible. You think that, in spite of God’s revelation, this gulf remains. It’s not only God who crosses this gulf—but we must also do our part to cross it. We must also ‘interpret’ revelation. We must also make revelation understandable. In a word, we ourselves must make revelation possible through all our hand-wringing hermeneutical endeavours. You see, my friend: natural theology!” He thumped the table and took a triumphant mouthful of wine. Lollo was leaning towards him in silent approval. They signalled for the waitress, who approached them yawning and dishevelled with a chewed pencil stub behind her ear. When they asked for another bottle, she mumbled assent and scribbled something in her notebook. With the empty bottle in her hand she made her way back to the bar, scratching her head with the pencil before returning it to its perch above her ear. It was late, and the pub was nearly empty. All she could hear was the laughter and excited chatter of the three old friends beside the fire. —Robert W. Jenson, Systematic Theology, Vol. 2 (Oxford: Oxford University Press, 1999), pp. 177-78.
so not a soul is there. At a conference for Scottish students in 1975, I met two Dutch visitors, one of whom was a theological student. On the bookstall, there were some books written by the Dutch theologian G. C. Berkouwer (1903-1996). Some of my conversations with this theological student focused on Berkouwer. In 1976, while visiting Canada, I bought Berkouwer’s book Holy Scripture. Living out of a suitcase, I didn’t have many books with me. What did I do? 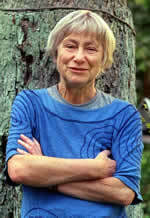 —I read Berkouwer. Reading became studying and writing. By the time I met him in his home in 1986, I had written a PhD thesis based on his writings. I spoke with him for one hour, but I felt like I had known him for a decade. Long before I ever laid eyes on him, I had loved him as a “father in the faith” (1 Cor. 4:15). He had helped me to praise God and to preach the gospel of grace with joyful thanksgiving. Patrik’s Systematic Theology World Cup is now famous (and again here and here). Faith & Theology is a year old today. Do you have any favourite posts or discussions from the past year? Or anything you’d like to see more focus on in the year ahead? Anyway, thanks for visiting—and a special thanks to anyone who has been visiting for the whole year! —Herbert McCabe, “Resurrection and Epiphany,” in God, Christ and Us, ed. Brian Davies (London: Continuum, 2005). I’m thinking of writing an article about prayer as the justification of human speech about God. I’ve been deeply impressed by the way this concept has been articulated among some of Bultmann’s followers (e.g. Heinrich Ott, Gerhard Ebeling, Eberhard Jüngel)—the hermeneutical problem of speech about God is resolved into the givenness and the demand of prayer as speech to God. So if anyone has any reading suggestions relating to this topic, I’d be most grateful. “Who then is God, that we must speak of him? God is he whom we must thank. To be more precise: God is he whom we cannot thank enough” (Jüngel, “Gott—als Wort unserer Sprache,” in Unterwegs zur Sache, p. 103). Aaron Ghiloni offers some wise words about grief. I’ve added a new poll—so come and vote for your favourite theologian from among the finalists of the previous five polls. There is a patristic theologian (Augustine), a Reformed theologian (Barth), a modern Lutheran (Bonhoeffer), a contemporary Anglican (N. T. Wright), and a modern Catholic (Balthasar). And while you’re in a voting mood, you might like also to stop by Exiled Preacher and vote in the poll there on conservative evangelical theologians (at the moment Don Carson and Sinclair Ferguson are both ahead of Kevin Vanhoozer, which is simply criminal). Also, make sure you’re visiting God in a Shrinking Universe each day to vote in the finals of the Systematic Theology World Cup (you need to leave comments in order to vote). Over at Pontifications, Al Kimel suggests that the Catholic Church needs to “get over” Karl Rahner. The Church’s future, he suggests, lies with Balthasar rather than Rahner. Personally, I think it would be better to get back to Rahner. After all, hasn’t he already become a theological “classic,” i.e., someone whose books are always mentioned but never read? And is it a good thing if we “get over” a thinker like Rahner without first coming to terms with him for ourselves? So although I feel perfectly happy about the current Balthasar renaissance, my own suggestion is that we should get “back to Rahner” as well—just as some Protestants (yes, even Barthian Protestants!) are now starting to get “back to Schleiermacher” in new and fruitful ways. 1. Preparing. You must prepare because you may prepare. God is about to gift you with the gospel! Although you can do nothing to be ready for it, you must do everything you can to get ready for it. You rightly expect the preacher to prepare before he preaches – and he rightly expects you to prepare before you listen. No lazy bastards in pulpit or in pew! 2. Expecting. When the preacher speaks, God will speak – to you: that must be not only your hope but also your expectation. So what that the Revd. Bloggs is errant and inept? The power of the sermon no more depends on the excellence of the preacher than the effectiveness of the eucharist depends on the character of the president. Treasure comes in cracked clay jars. Homiletics too is theologia crucis. 4. Discerning. There is, of course, no guarantee that God will speak to you through the preacher. The preacher may come with gold, or with fool’s gold. You must test the spirits – which means that you must be critical. You must listen not only to the Word but also for the Word – which means (as the Reformers taught) that you must distinguish between Bible and gospel. 5. Praying. Critical intelligence is a necessary condition for listening to the sermon, but it is not a sufficient condition for hearing the gospel. Only the Holy Spirit can give us the ears of evangelical faith and understanding. “Veni, Creator Spiritus!” Epiclesis is as crucial in the ministry of the Word as it is in the ministry of the sacrament. 6. Dying. “When Christ calls us, he bids us come and die” (Bonhoeffer). Every act of worship is a funeral. In the sermon the preacher hereby notifies the congregation that it is dead and buried – an ex-people. This is not a metaphor, this is our reality coram Deo. Listen to the sermon as if it were your own obituary: it is. Judgement is now. 7. Rising. The sermon is your own obituary – it is also the announcement of your own re-birth. The preacher has been likened to a surgeon; he is also a midwife. If the first reaction to the sermon is recoil, the ultimate response is “Rejoice!” – and pass around the cigars! The non-people are a new people! Resurrection is now! 8. Serving. One who hears the Word but does not do the Word has not heard the Word. George Herbert said that “sermons are dangerous things; that none goes out of church as he came in.” “Pastor,” said the worshipper, “what a wonderful sermon!” “That,” replied the preacher, “remains to be seen.” When the liturgy is over, the leitourgia begins: your ministry of reconciliation and liberation. 9.5. ...though Heckling might help too! —Helmut Gollwitzer, The Rich Christians and Poor Lazarus (New York: Macmillan, 1970), p. 3.